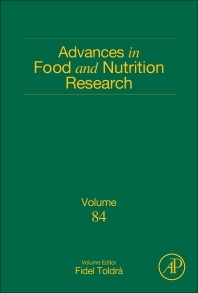 Advances in Food and Nutrition Research, Volume 84 provides updated knowledge on nutrients in foods and how to avoid their deficiency, especially the essential nutrients that should be present in the diet to reduce disease risk and optimize health. The book provides the latest advances on the identification and characterization of emerging bioactive compounds with putative health benefits. Readers will find up-to-date information on food science, including raw materials, production, processing, distribution and consumption, with an emphasis on nutritional benefits and health effects. Specific sections in this new release include discussions on ethylcellulose oleogels, novel biosensors for the rapid detection of toxicants in foods, polyphenols and their interactions with other dietary compounds- implications for human health, protein hydrolysates and hypolipidemia, the effects of B-alanine supplementation on carnosine elevation and physiological performance, the effect of ultrasound technology on food and nutritional quality, modern procedures for removal of hazardous compounds from foods, the bioactive potential of Andean and Amazonian fruits, seeds and tubers, and more.